SNHR has released a report entitled: “A Bloody Day in Idlib despite the Ceasefire Agreement”. The report documents three massacres that took place in Idlib city on Tuesday, February 7, 2017. The report draws upon a number of testimonies by residents, eyewitnesses, and survivors, where the report includes three testimonies. The report notes that SNHR has explained the purpose of the interviews to the eyewitnesses who gave us permission to use the information they provided in this report, without offering or presenting any incentives. Additionally, SNHR tried to spare them the agony of remembering the violation, and we gave guarantees to conceal the identity of the eyewitnesses who preferred to use an alias. 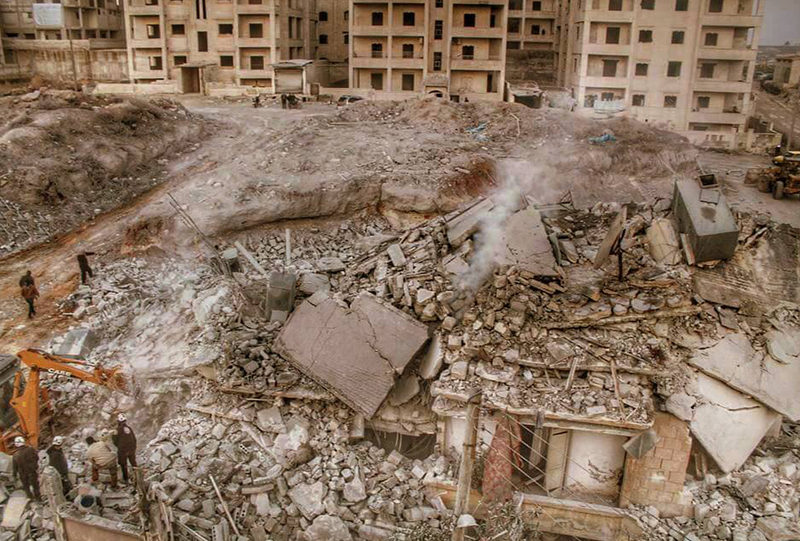 The report includes pictures and videos, which have been verified, that show the huge destruction in the aftermath of the bombardment. Also, the picture show children victims who died in the bombing. According to the report, the targeted areas were civilian areas, where no military centers or weapon warehouses for armed opposition factions or extremist Islamic groups were found during or before the attack. The report says that at roughly 03:45, fixed-wing warplanes we believe are Russian carried five airstrikes at least in which no less than 11 missiles were fired. The airstrikes lasted for about 50 minutes and targeted multiple sites, which resulted in the killing of 29 civilians including 15 children and 11 women (Adult female). Additionally, a number of residential buildings were damaged. The report notes that the airstrikes targeted five different sites -where there were casualties in four- resulting in three massacres. The report says that the bombardment mentioned in this report has targeted armless civilians. Therefore, the Syrian forces have violated the rules of the international human rights law which guarantee the right to life. Additionally, these violations were perpetrated in a non-international armed conflict which amounts to a war crime where all elements were fulfilled. Furthermore, the report calls on the Security Council to take additional steps after Resolution 2139 was adopted and no pledges to cease the indiscriminate bombardment operations have been made. All the parties to the conflict must respect these steps and adhere to the rules of the international humanitarian law. The report also emphasizes that the Syrian case must be referred to the International Criminal Court, and all those who responsible must be held accountable. Also, the norm of the “Responsibility to Protect” must be implemented in order to save the Syrians’ lives, culture, and arts from destruction, theft, and sabotage. Lastly, the sanctions must be expanded to include the pillars of the Syrian regime and the Iranian regime who are directly involved in committing crimes against humanity and war crimes against the Syrian people.